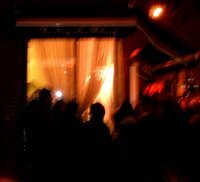 Last Saturday night, I headed back into New York City. This time, I thought I'd spare myself the long subway ride, so I headed for Greenwich Village and the East Village. 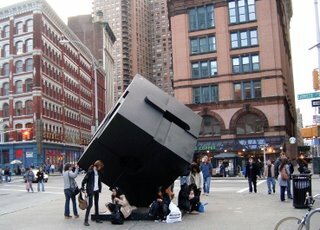 My first stop was "Alamo", the evil twin of "The Cube", one of my favorite locations in Ann Arbor. 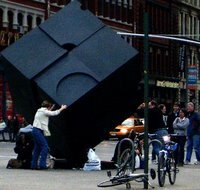 They say the University President spins the cube each morning to start up the University. Here, the cube was harder to spin, what with all the people loitering underneath it. Still, as I was leaving the area, a group of people got it started. 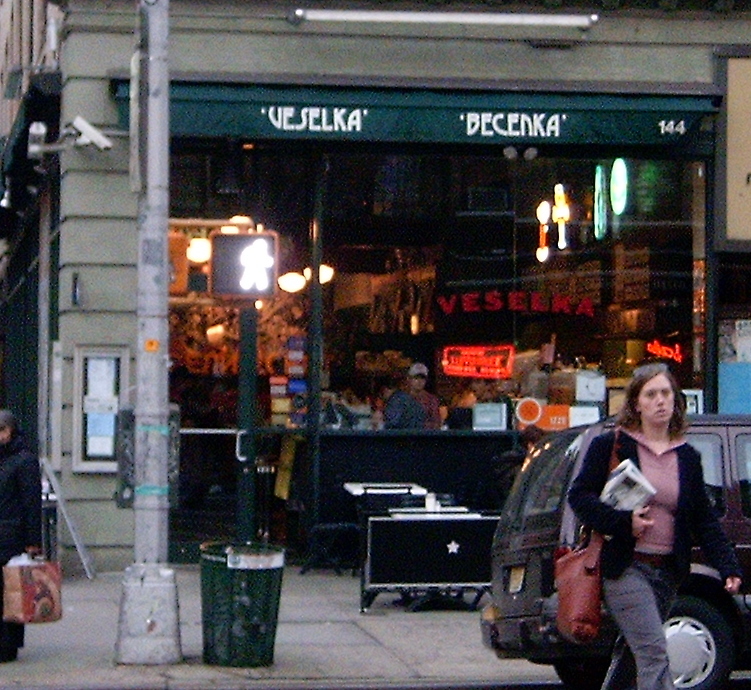 Next, it was off to Veselka, a Ukrainian restaurant. I had last enjoyed Ukranian food in 1999 in Winnipeg. 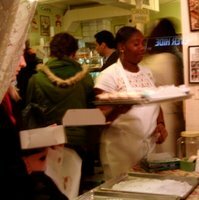 I sat at the counter and had some delicious pirogies. I was thinking of buying a t-shirt to commemorate the visit, but the t-shirts read "Challah-leujah!" and "Beet me", neither of which seemed interesting enough to wear. 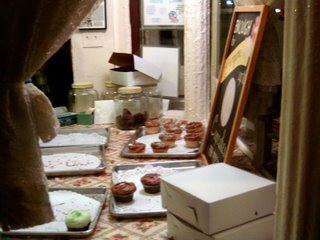 No doubt that bakery’s got all da bomb frostings. I got there, and the line ran down the block. After 20 or so minutes waiting, I was allowed entrance to the store. I was allowed to approach the cupcakes and buy no more than a dozen. Since I had to transport these home via subway and Amtrak, I stuck to one box. Five seemed about the limit without overly squishing the frosting. I brought them home to Christina, and we enjoyed them over the next few days. I don't know what I was thinking considering getting a dozen -- one cupcake per day is probably about 1/2 a cupcake more than necessary. Still, they were really good, and I hope to go back the next time I'm in Manhattan. Greetings from Hoboken. Since that doesn't sound exciting, I decided to start the weekend off with a trip into New York City. Specifically, I ordered a ticket to the Nats-Mets game at Shea Stadium. It took about an hour and a half to get from my hotel in Jersey City to Queens. It's always entertaining to see a city through the eyes of its sports fans. ("Hey, what's that guy doing coming here with a Boston jersey?" "Better than a Yankees jersey." "Yeah, but still...") The seat was excellent. On the loge level (just above field level), and almost directly behind home plate (as you can see from the album above). It seemed to be a great place for catching foul balls...at least two headed into the adjacent section and one was nabbed on the concourse in front of me. I decided not to provoke the New Yorkers by displaying any outward signs of Nats fandom. In fact, I did not see one single piece of Nats gear on any fan. 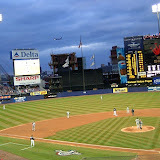 I quietly cheered the Nats on to a 2-2 tie, which they held into the 7th, and then...I left. It was really cold, and I had to get up at the crack of dawn to make it to the conference I'm actually here for. 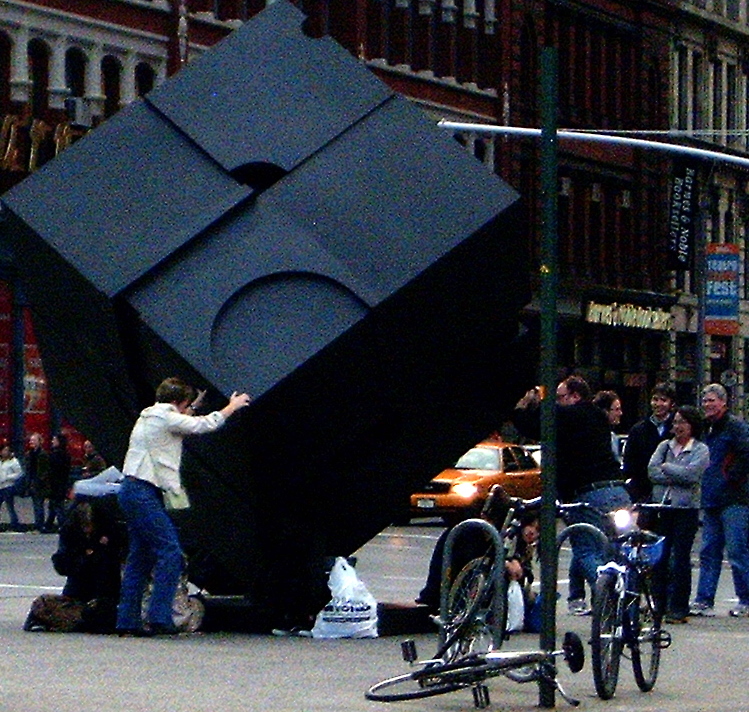 I tried to hang in longer, but yet another pitching change sent me headed back to the subway. So I only was able to hear the crowd roar as the Mets scored the game-winning run. By my count, that's 8 major league baseball teams I've seen home games for. Last weekend, Christina and I headed out on our first ever geocaching expedition. Geocaching is an activity which involves using a GPS receiver to search for hidden containers ("caches") of items which have been placed by other geocachers. Typically, people will take one small trinket and leave another. The cache we were looking for ("Maryland Marathon") was not the simplest type of cache. It involved visiting 6 sites across the University of Maryland campus to find clues. These clues allowed us to find the coordinates of the actual cache. In addition to the normal swag we exchanged (we took a little carved box and left Pez dispensers), we took something called a "travel bug". A travel bug is an object whose travels you can track on the web. 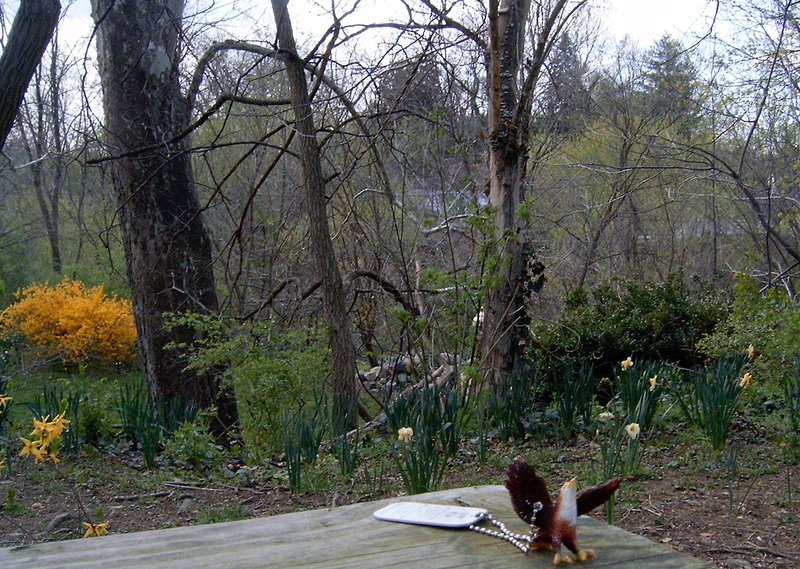 (As geocaching.com says, "Live vicariously through inanimate objects.") This particular item was a plastic eagle known as Northern Harrier that started out in January in Bowie. It has the goal of visiting state and national parks. When we got back, I did a little bit more research and read up about the related activity of waymarking. 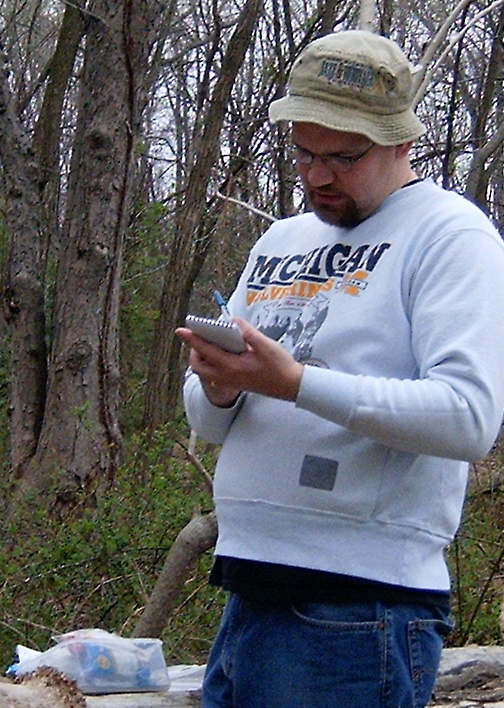 Waymarking is like geocaching without the cache. In other words, the goal is to visit particular coordinates that already contain items of interest. 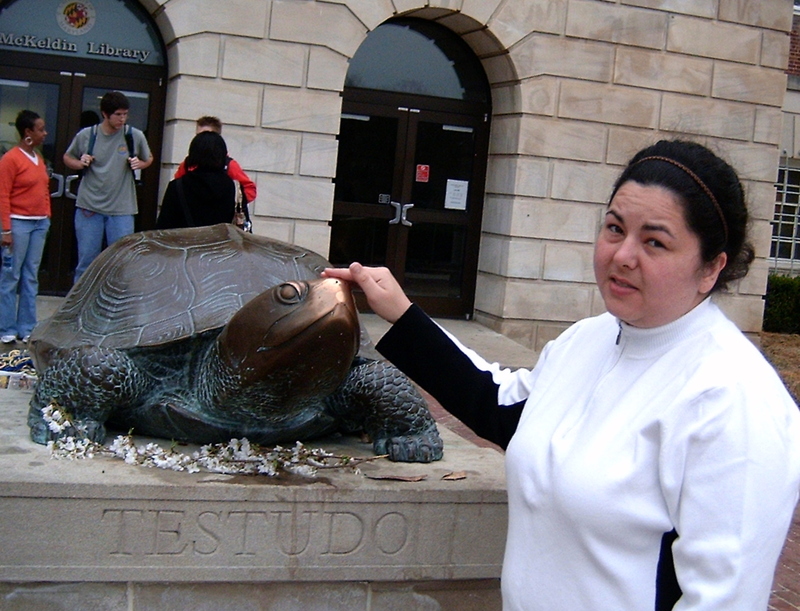 For example, in pursuit of the Maryland Marathon cache, we visited the statue of Testudo, the University of Maryland's mascot. As it turns out, this has been waymarked. So I logged our visit. On Friday, I continued with this pursuit. 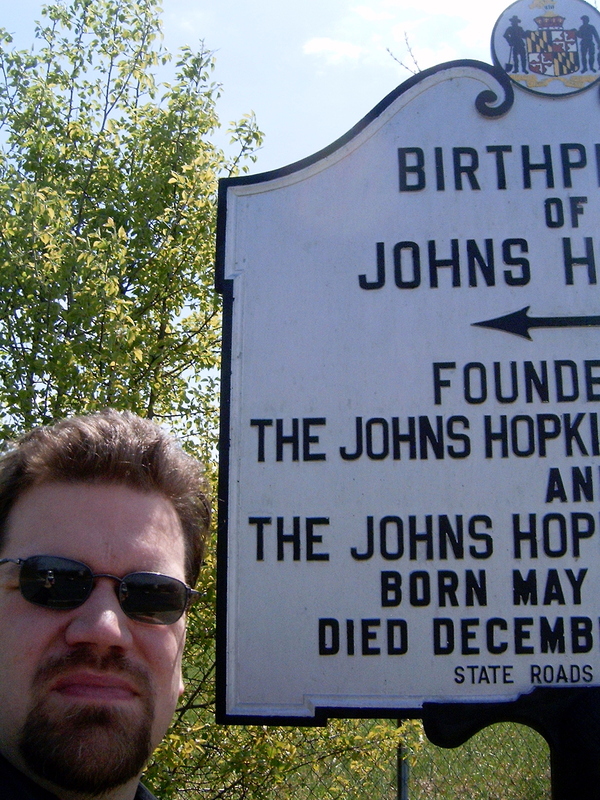 At lunch, I went to a car wash that, as it turned out, was near the birthplace of Johns Hopkins. 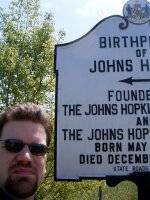 The rules for logging a visit to a Maryland Historical Marker waymark require taking a picture of you or your GPS receiver with the marker, which was a little bit tricky since I was by myself. Later that day, on my way to Paul's, I visited the Patriotic Wheaton cache in a nearby park. In geocaching argot, I TNLNSL. Today, I decided to kill several birds with one stone. 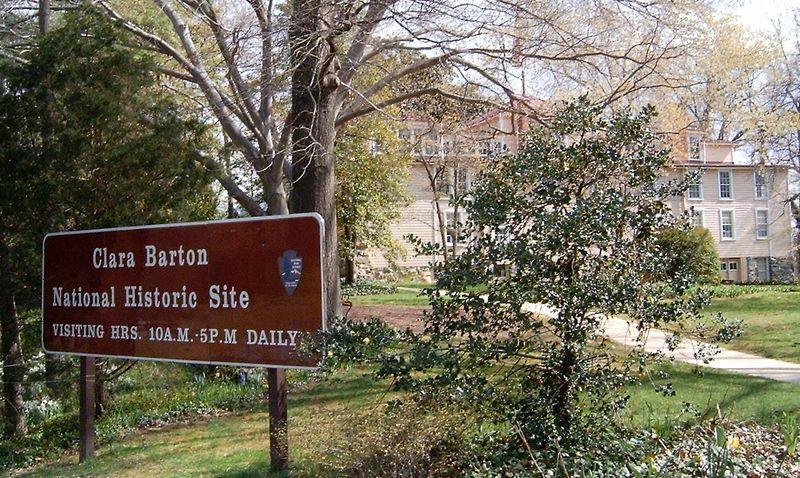 First I went to the Clara Barton House historical marker. Then, because I actually like visiting things, I took a tour of the house itself. I bailed halfway through the tour when it seemed to be more about showing kids how life in the olden days was than about Clara Barton. Then, Northern Harrier and I visited Glen Echo Park, a national park. With that part of his mission satisfied, I drove to near the Jason Turns 30! cache, where I dropped off Northern Harrier. So as of now, my geocaching and waymarking stats each show 3 visited. Here are links that will update as I visit more. I'm hoping to talk Christina into another expedition. It's more fun when you have someone to share it with. And the pictures turn out better!